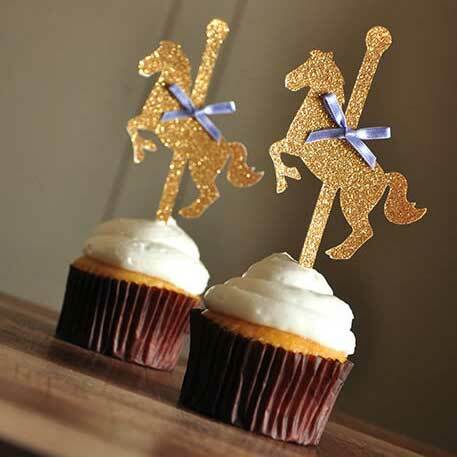 Below are ideas for Carnival Party Games. 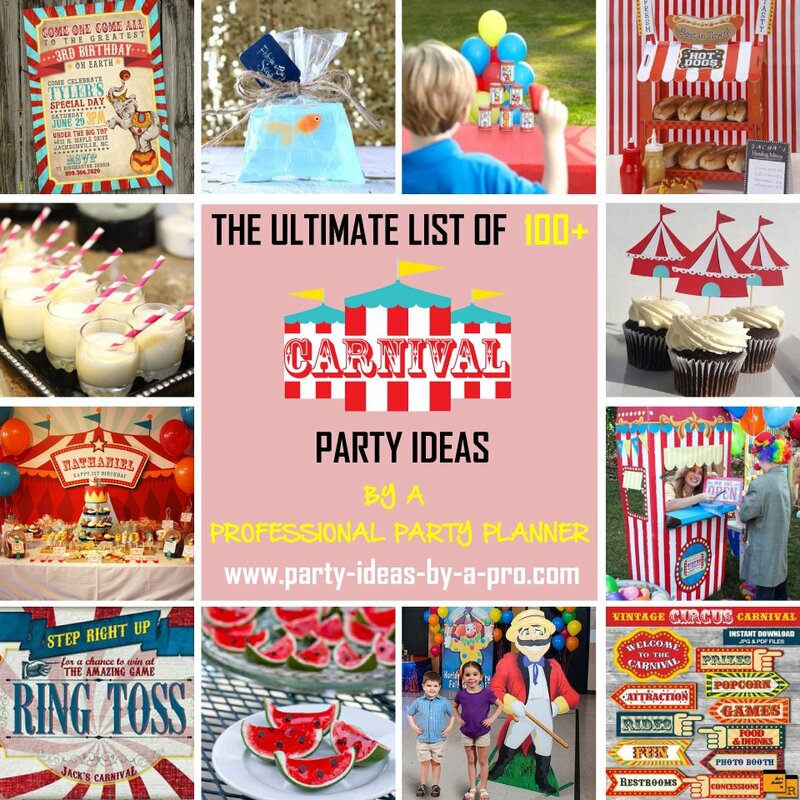 Don't forget to check out my other page of Carnival Theme Party Ideas—with tips for invitations, food & drink, decorations, and styling. 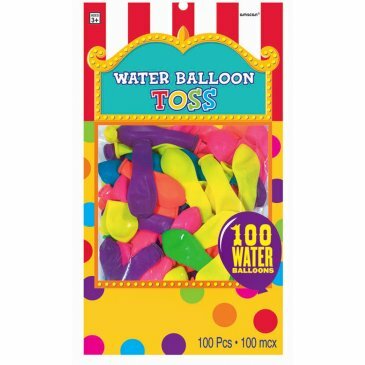 Below are lots of suggestions for Carnival Party Games and Activities suitable for a Carnival theme party or kid's birthday. 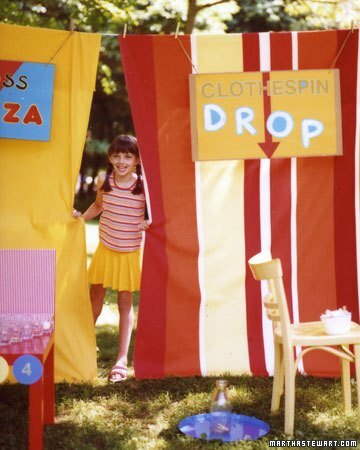 Here's a great tip from Martha Stewart for how to create side stalls and booths for the Carnival party games below. Just raid your linen closet for colourful sheets, beach towels, and blankets (or pick up some cheap fabric by the roll) and hang these from ropes or clotheslines tied between trees. 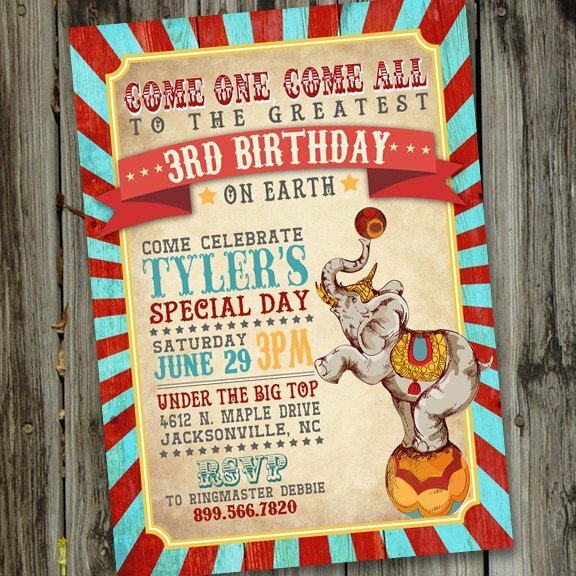 Then all you have to do is create homemade signs for each of the Carnival party games below to hang on top. 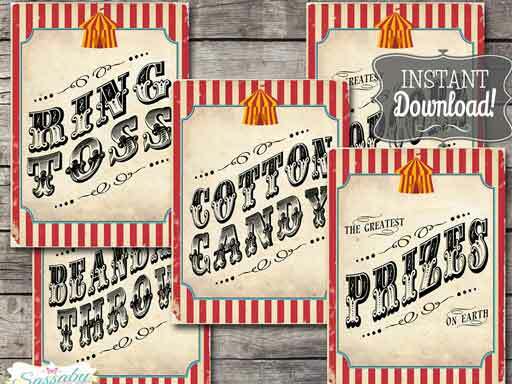 Alternatively, you can buy some of these printable Carnival signs from supplier 4. 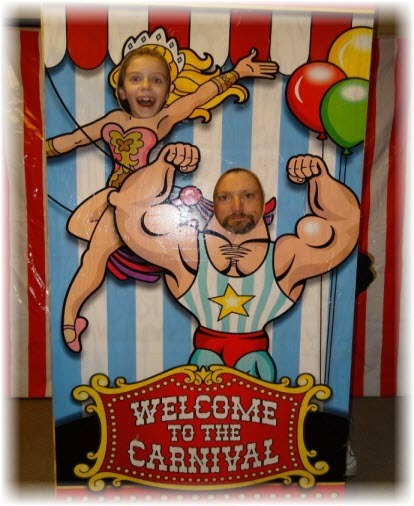 One idea is to have the kids play individual Carnival party games to win tickets or tokens. You could use these cheap Bingo chips (which come in bags of 500) or a roll of star tickets (available in different colors) as the tokens. Both are available from supplier 5. Then you can set up one big prize stall where they can redeem their tokens at the end. 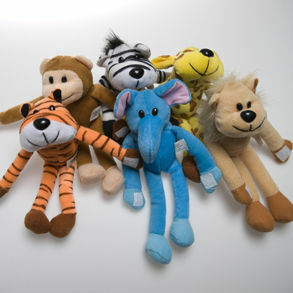 You can stock the prize table with a whole range of different size prizes and treats with different values (ie a large plush toy could be 10 tokens, whereas smaller items might need only one or two tokens). This way they can choose what they win and even leave with several prizes of different value. 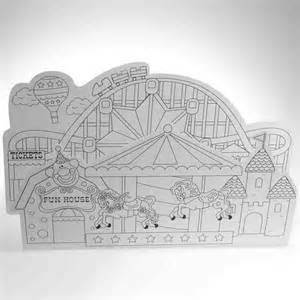 See supplier 5 for a range of toys and novelties which could be used as prizes for these Carnival party games. For other games, such as sack races etc, you could use these 1st, 2nd, 3rd place and honoree mention award ribbons, or these winner buttons as prizes. See supplier 3 for both. 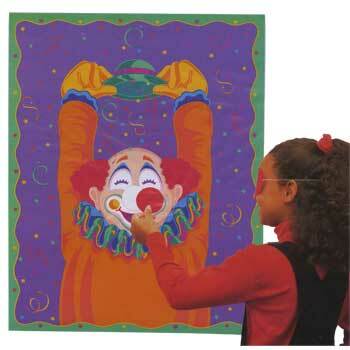 Cut a large picture out of cardboard to act as the target, ex a clown face with a hole for the mouth. 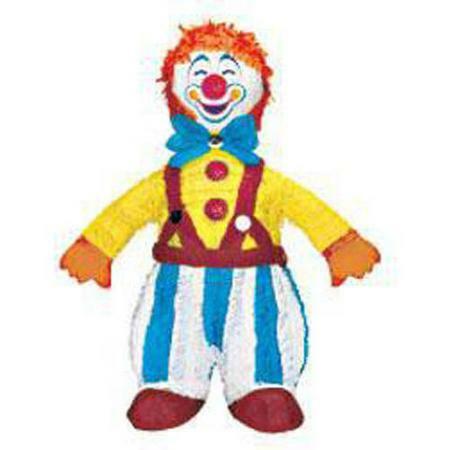 Then let the kids try to toss bean bags into the clown's mouth from a distance. 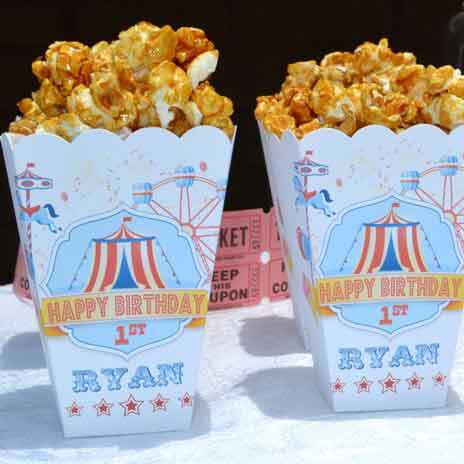 Alternatively, if you don't want to make this yourself, there are lots of variations of these Carnival party games available to buy, from simple canvas pouches (below right, from supplier 8) to clown print stand up options (below left, from supplier 2). 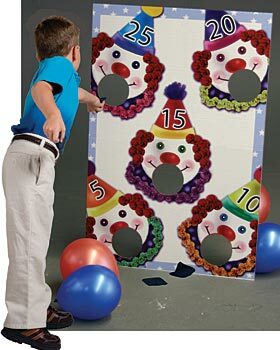 Attach lots of balloons to a cork board and use darts to see how many they can pop. 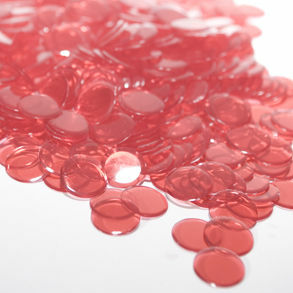 Have a stock of spare balloons already blown up so that you can replace any that they pop quickly and easily. You can pick up packs of darts and balloons from supplier 3. 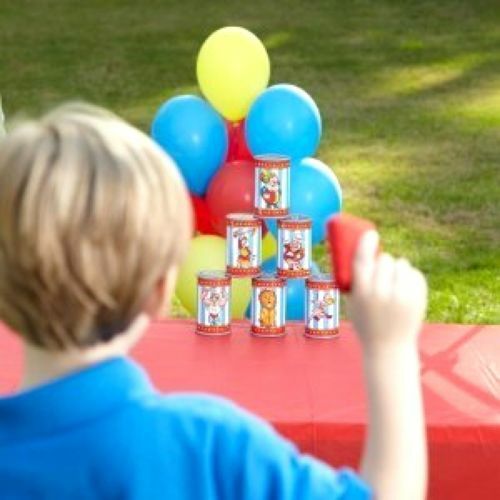 Stack up tin cans in a pyramid and use rubber balls to see if they can knock them down. 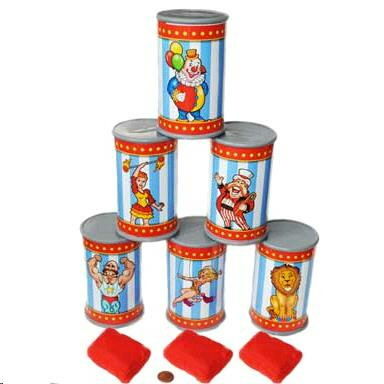 Alternatively you can buy this Carnival themed version from supplier 8 which includes the tin cans and bean bags. 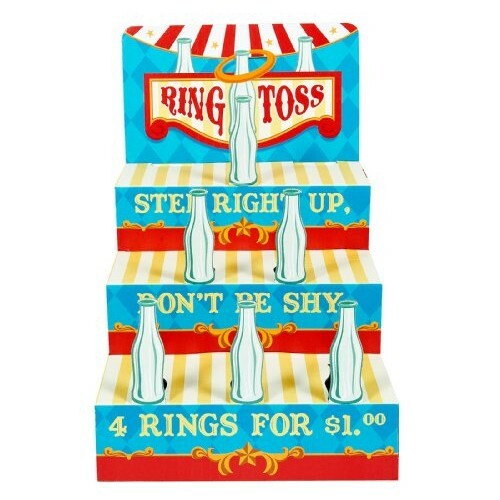 The Ring Toss is a bit more exciting when the kids are actually trying to get the ring over a particular prize, so set up some small plush toys raised up on blocks. Alternatively you could just use simple objects such as wine / soda bottles (but remember to weight them down so they don't fall over when a ring hits them). 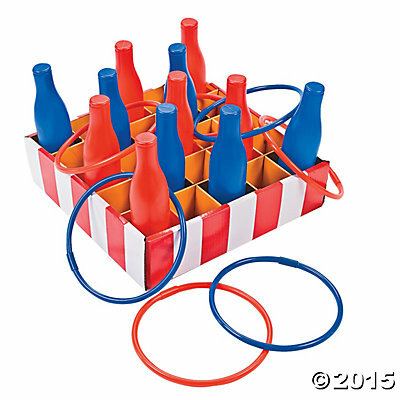 There are several variations of these Carnival party games that you can buy, such as this cardboard version (below left, from supplier 6) or this plastic bottle version (below right, from supplier 8). 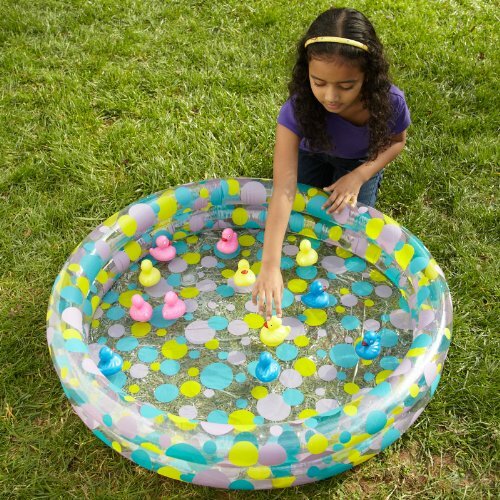 Set up a kids padding pool with lots of rubber ducks. 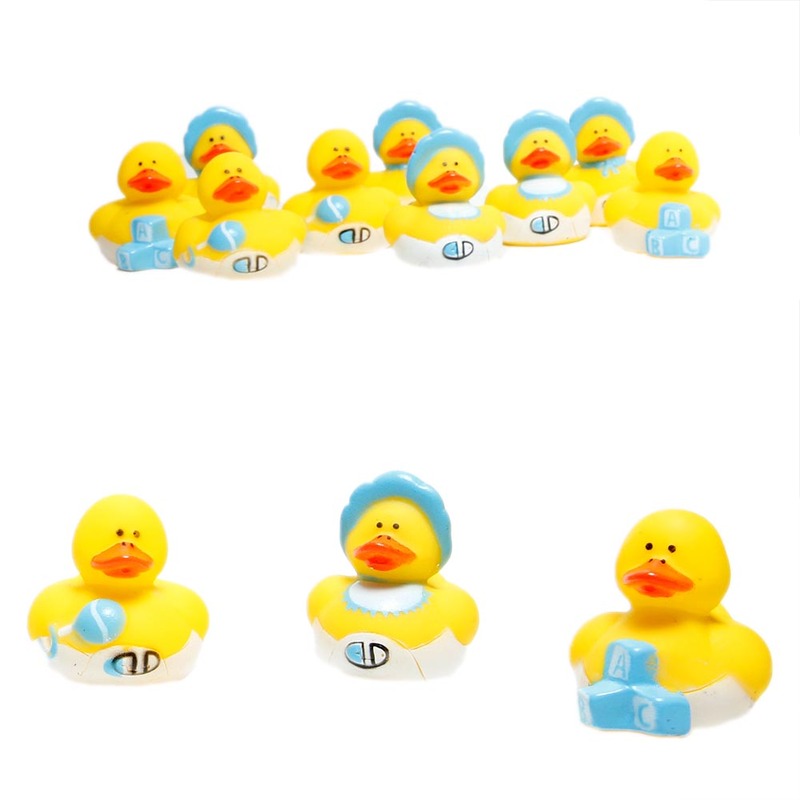 Mark the bottom of some of the ducks in advance to indicate how many tickets they win (ex, none, one, two, etc). 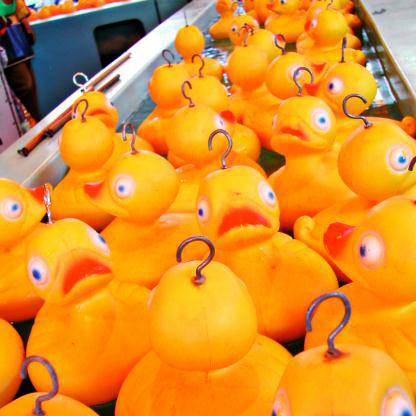 Give the kids fish scoops to try to catch a duck while blindfolded. You can pick up all the components from supplier 5. Lay out different targets on a table (or on the ground) and have the kids throw a penny to try and get it to land on the target. 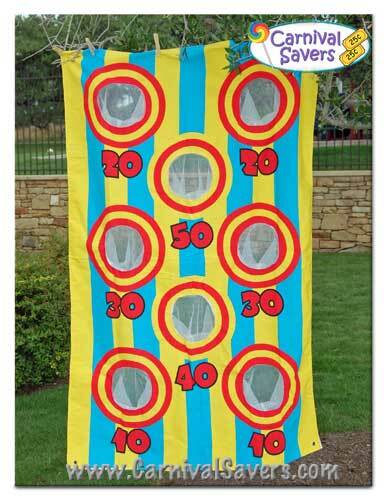 You can theme some of the carnival party games such as this one even further by using these cut outs (from supplier 3) as the targets and writing on the back how much each one is worth. Set up a Tattoo booth with temporary / washable tattoos for kids. 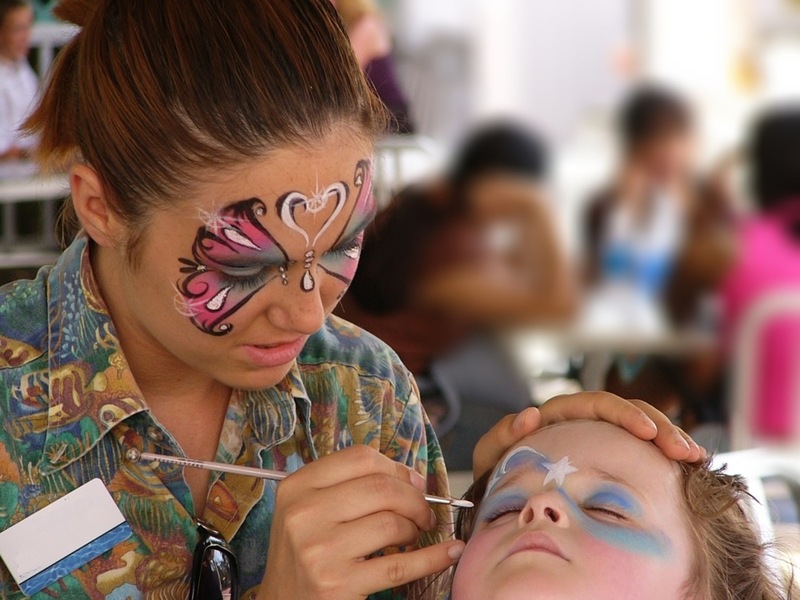 You could also combine this with face painting / clown make up classes. See supplier 3 for supplies. 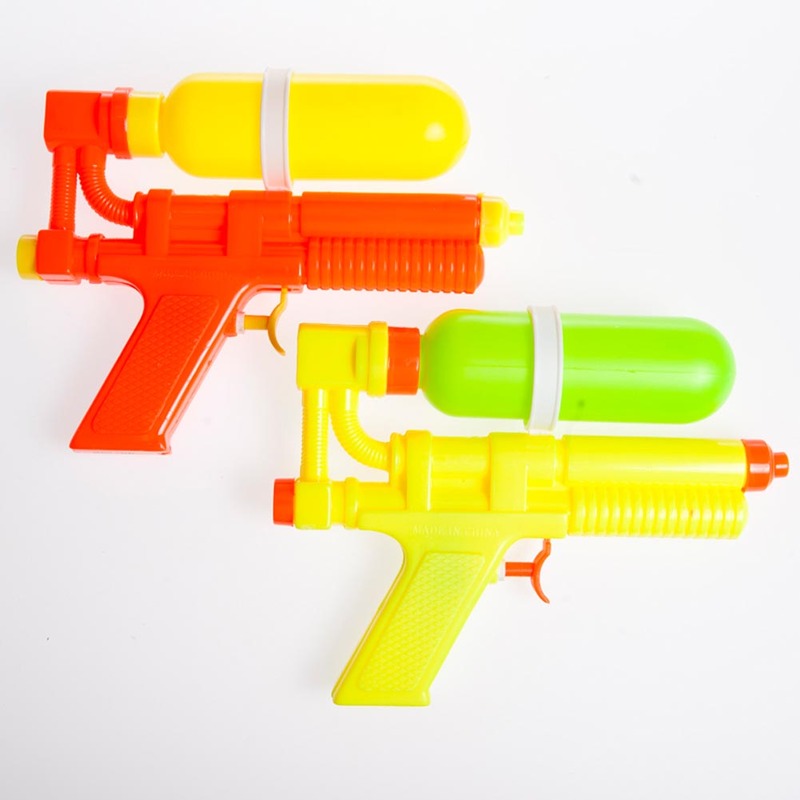 Set up a row of rubber ducks and let the kids use a super-soaker to try to shoot them off. Alternatively, you could use ping pong balls balanced on golf teas (stick the teas into a block of Styrofoam). 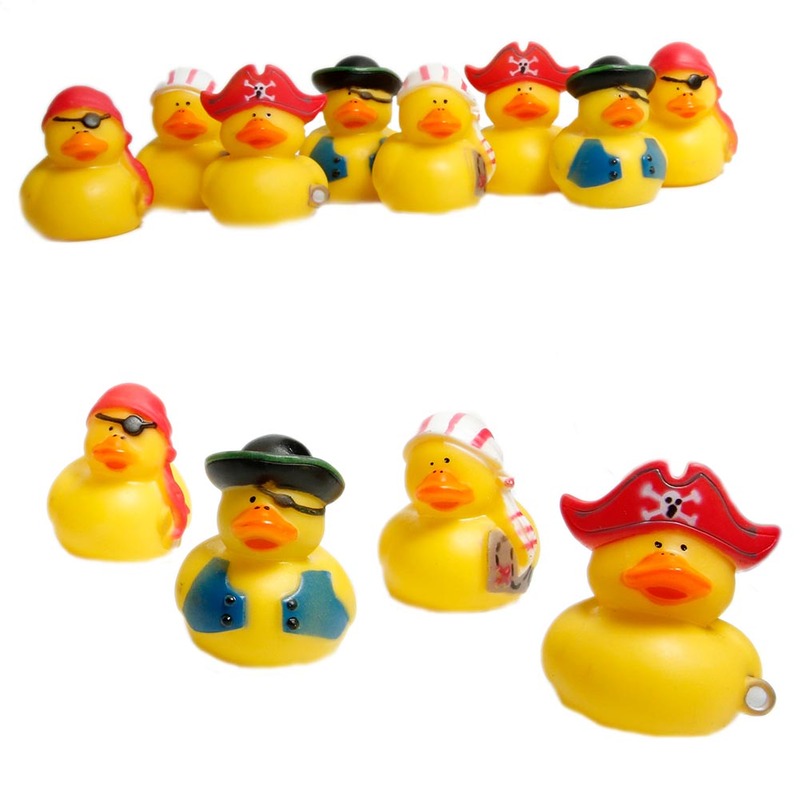 Check out supplier 5 which has an enormous range of themed rubber ducks (as well as the supersoakers below) including baby shower ducks, superhero ducks, pirate ducks, viking ducks, hippie ducks.....the list goes on! 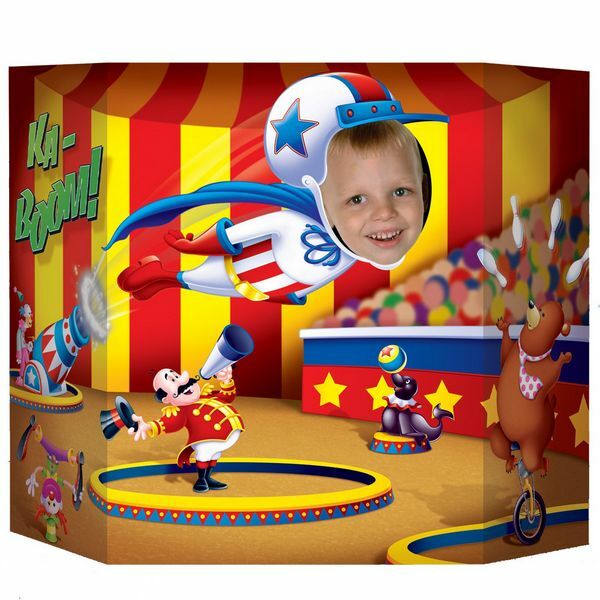 Pick up this classic muscle man peep-through photo board (from supplier 3) or this general carnival themed one (supplier 2) and use it for photo-ops. 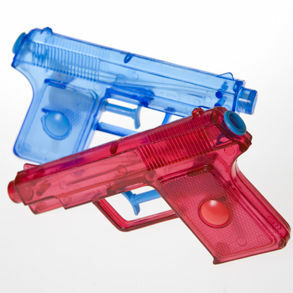 Use the same muscle man peep-through plastic photo board (above) and let the kids toss a wet sponge to see if they can hit each other (or a parent!) in the face. 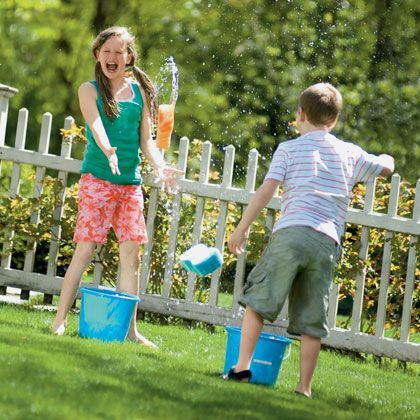 Let the kids see if they can toss a ball into a basket from a distance. 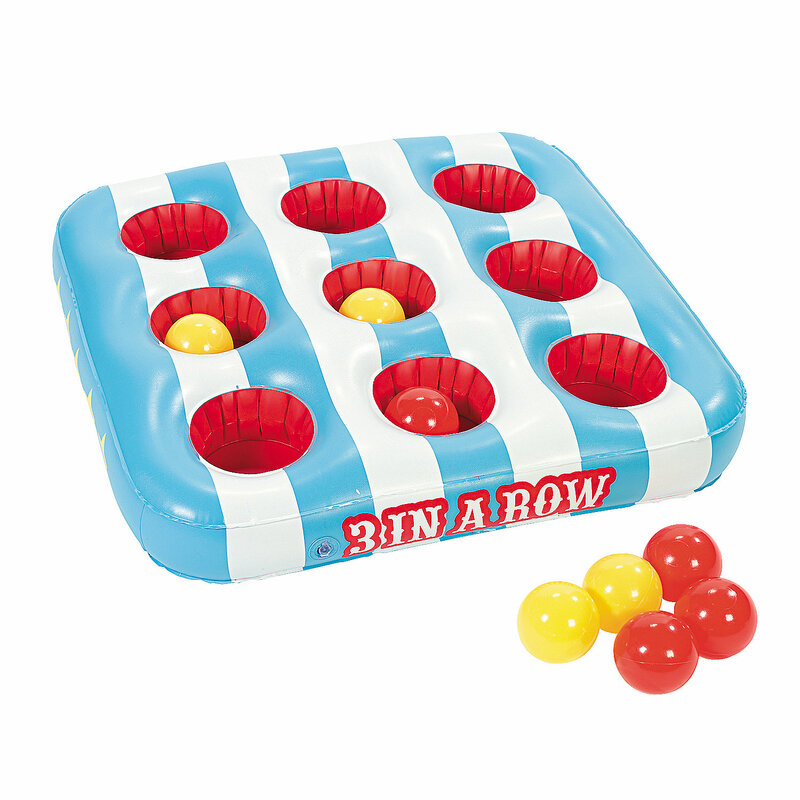 Alternatively, use this 3 in a row game from supplier 8. 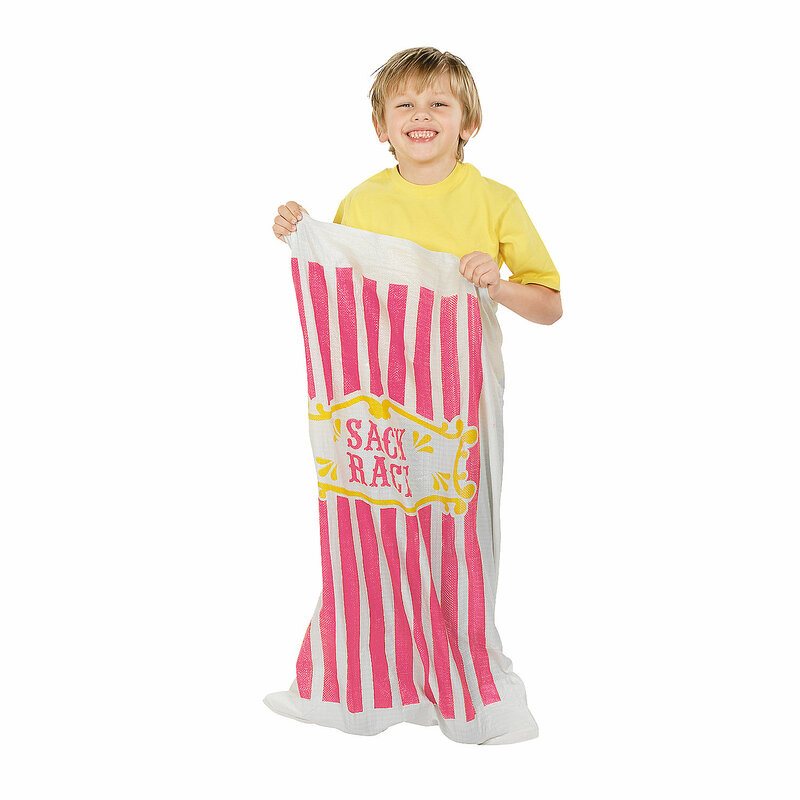 Use this pack of 12 carnival themed potato sacks from supplier 8 to hold sack races and award prize ribbons to the winner and runners up. 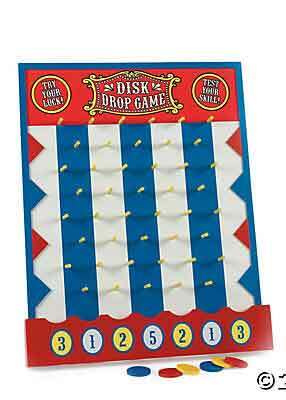 One of the more classic Carnival party games which isn't as easy as it sounds. 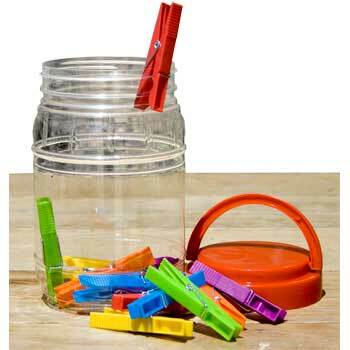 Let the kids see if they can drop a clothes pin into a glass jar while holding their arm straight out in front of them. 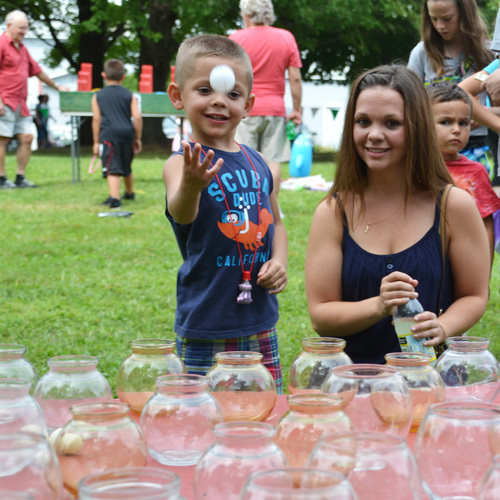 Balance coconuts onto wine / soda bottles (weigh the bottled down first) and let the kids see if they can knock them off with tennis balls. Set up some glass jars / tumblers and let them try to throw ping pong balls into them. 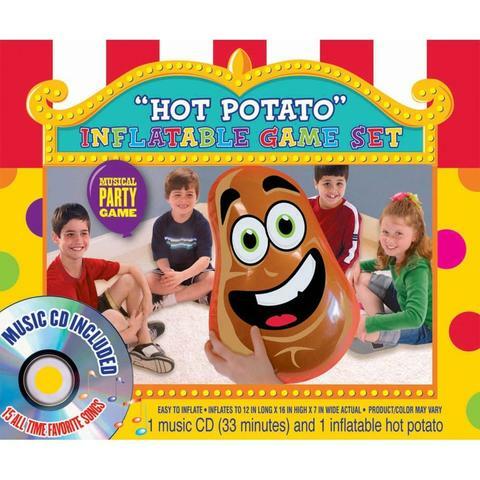 This inflatable hot potato game from supplier 3 is so cute. It comes with a music CD with 33 minutes of kid's songs. That should keep them busy for a while! 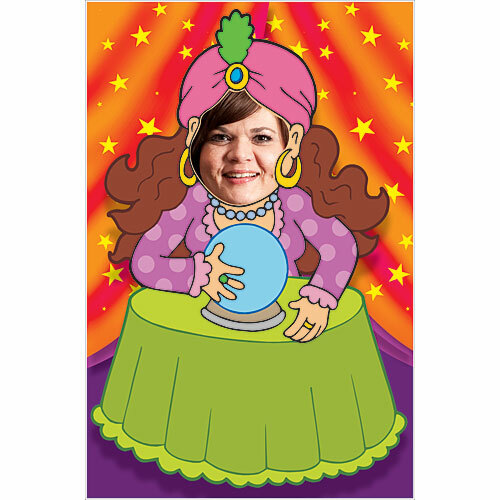 Have a parent or sibling dress up as a fortune teller and read the kid's palms and dispense fortune cookies. 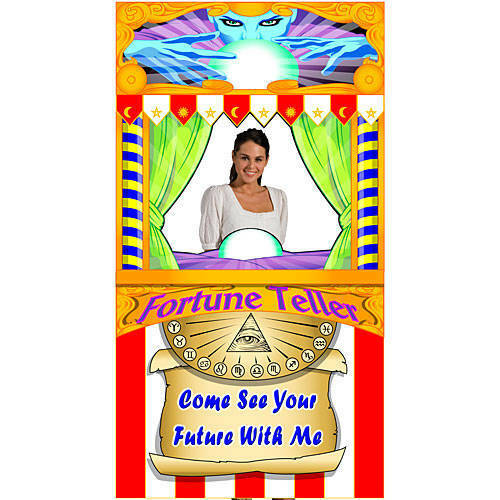 Or use one of these standees from supplier 2 to create your own fortune telling booth as part of the Carnival party games. 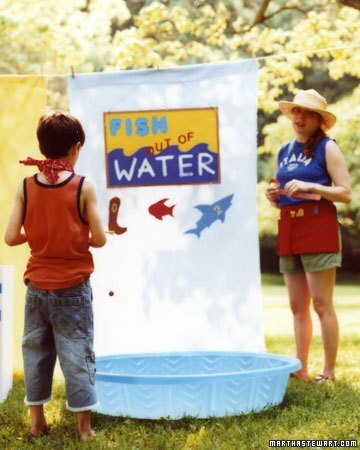 A variation on the dunk tank: pick up some cheap disposable rain ponchos for whoever is going to be the target and let everyone else use water balloons to try and get them wet. You can get these from supplier 3. This kit is a great little activity to include in your games. 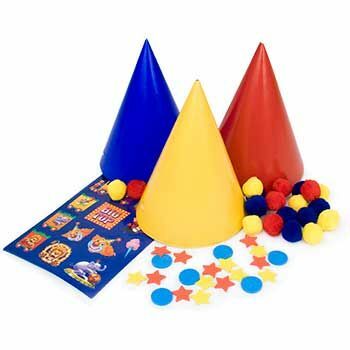 It includes 6 hats with various stickers, pom pom and foam attachments for everyone to decorate their own clown hat. See supplier 8. 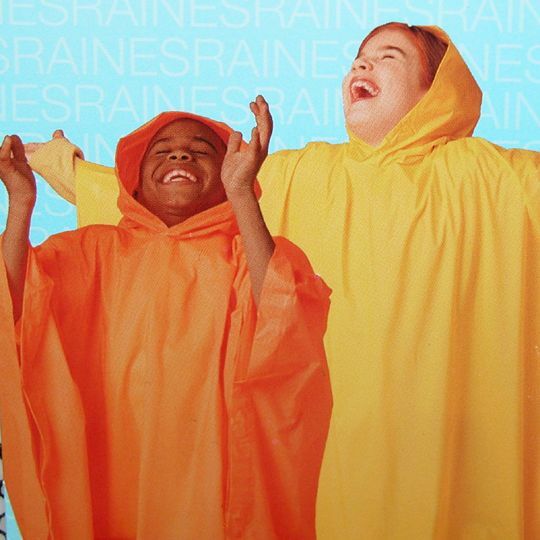 These coloring activities are perfect for indoor parties or if it ends up raining on the day. 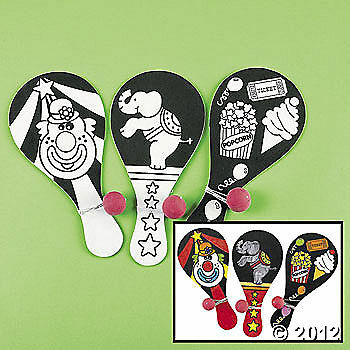 Either color your own Carnival scene, or color in a Carnival themed paddleball game. Both from supplier 5. 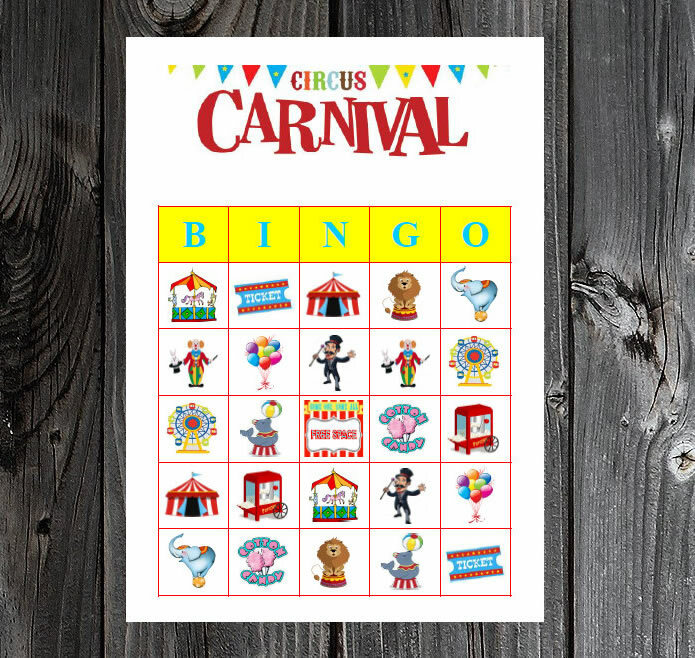 Another great option for a rainy day is this carnival bingo printable from supplier 4. 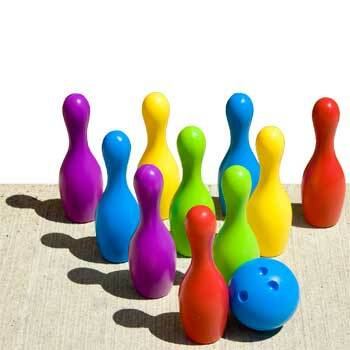 Set up some skittles for bowling (from supplier 3), or make your own using soda bottles. Let the kids play at being the Strongman by making some fake barbells using black balloons or Styrofoam balls sprayed black. Add the weight (ex, 100 lbs) to the balloons / balls using white cardstock. 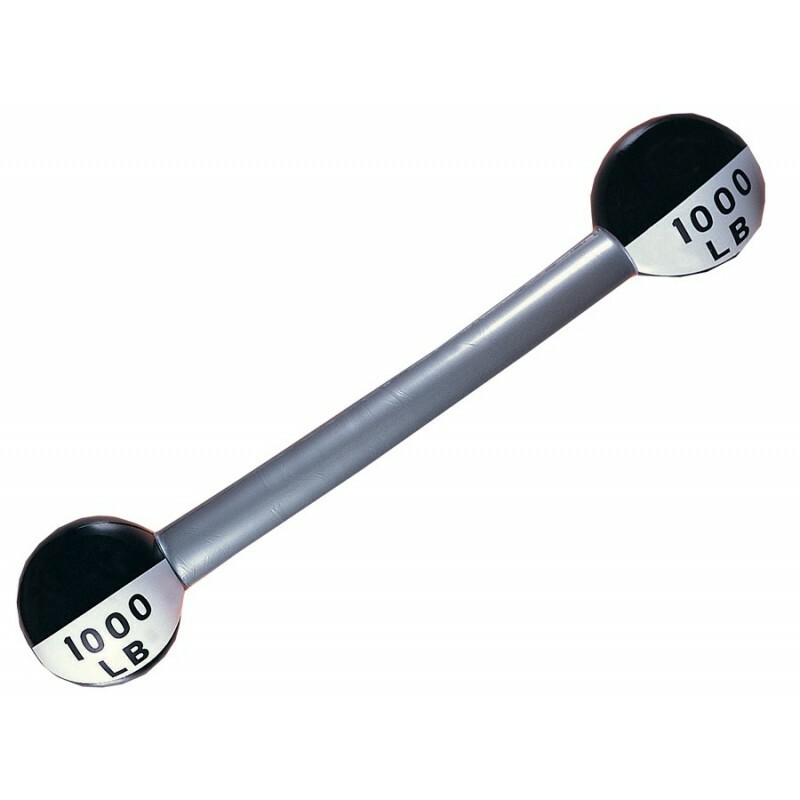 Alternatively, just use this Inflatable Barbell from supplier 3. 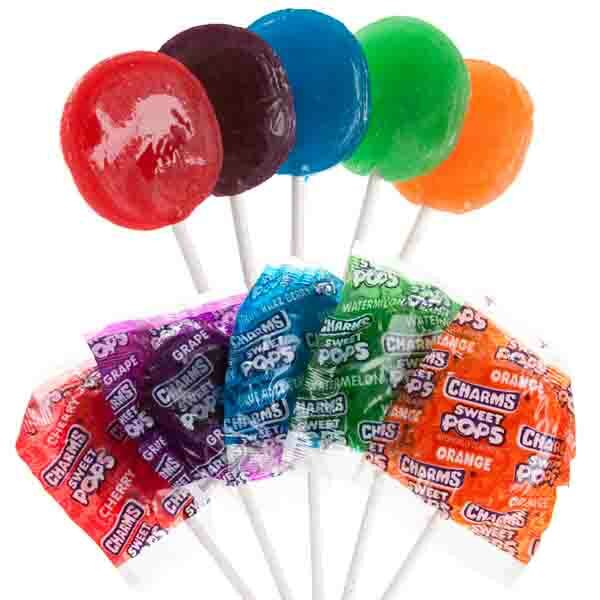 Use a Sharpie to paint lollypop sticks in different colors. 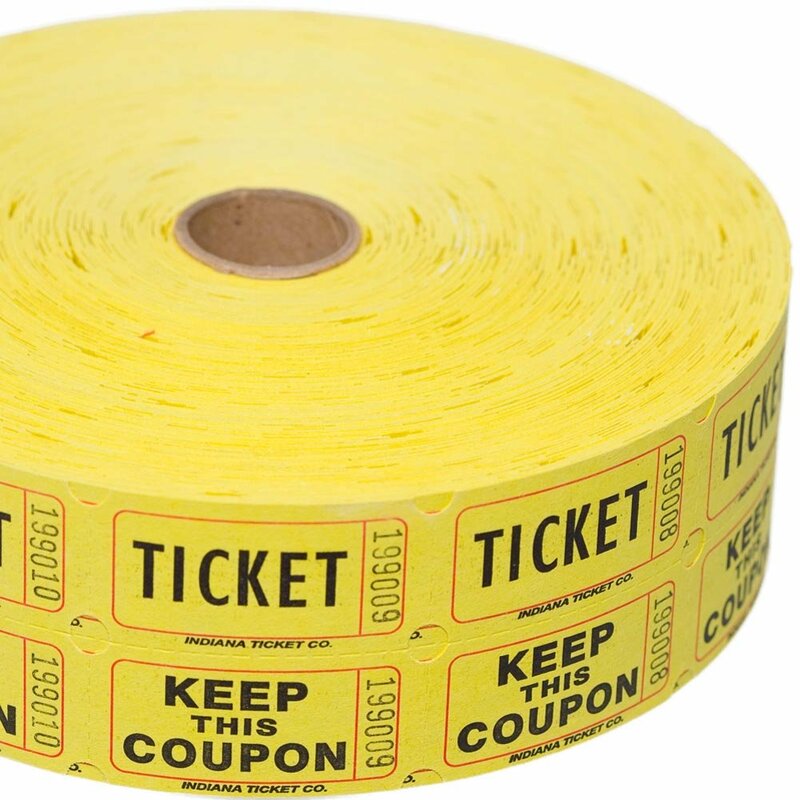 Have each color correspond to the number of prize tokens they will win (ex, Green = none, Red = one, Blue = two etc). Have lots of the lower number colors and less of the higher ones. Then, cut out a cardboard tree (or use this cheap cardboard tree, below left from supplier 3) and make numerous holes in it so you can slot the lolly sticks through. 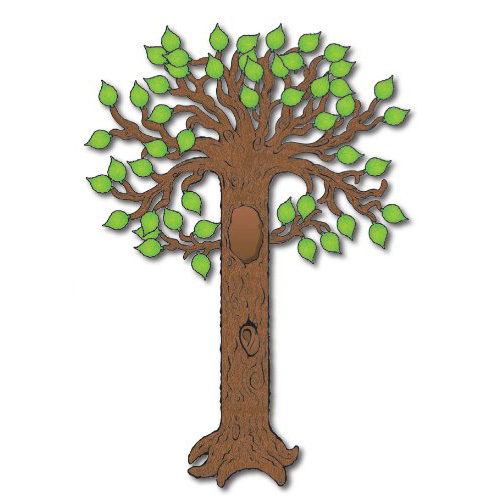 When viewed from the front you should only be able to see the head of the lollipop on the tree, not the stick. Have them take turns to pick a lolly to see what they win. 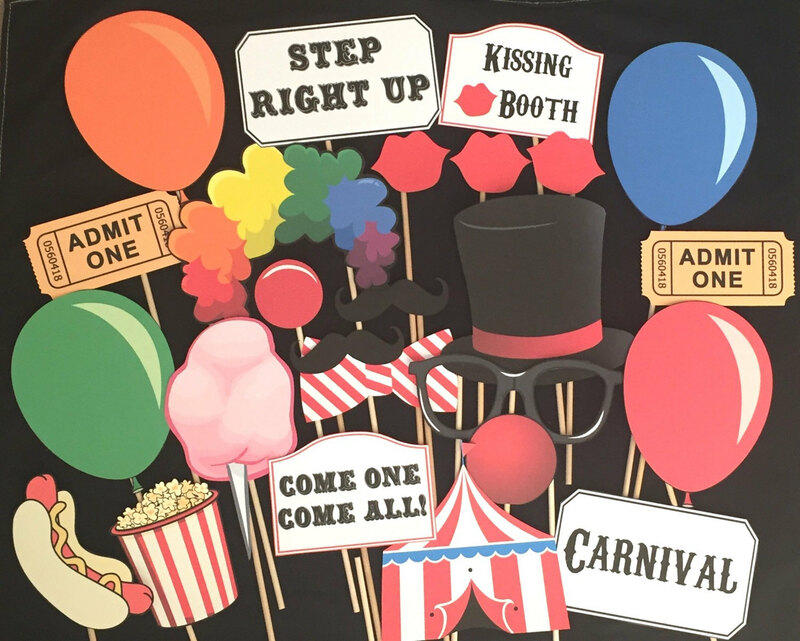 Use these carnival themed photo booth props and signs from supplier 4 to capture some fun memories of the day. 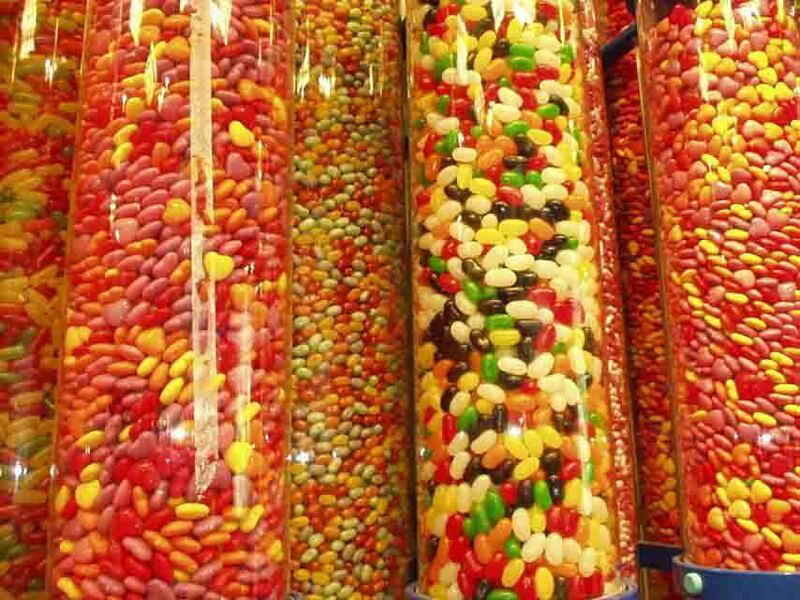 Fill a large jar with jelly beans or other small candies and have the kids try to guess how many there are. 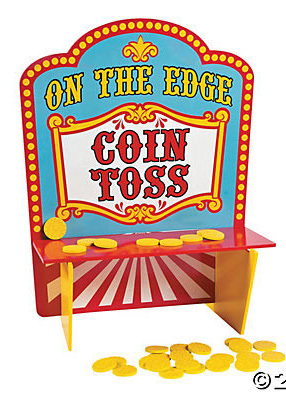 There are various ready made games available such as this Pie in the Eye disc toss, disk drop, or coin toss game. 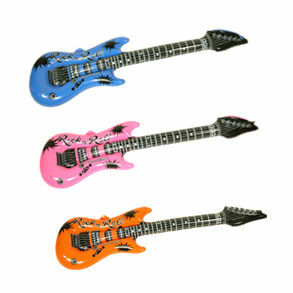 All are available from supplier 8. 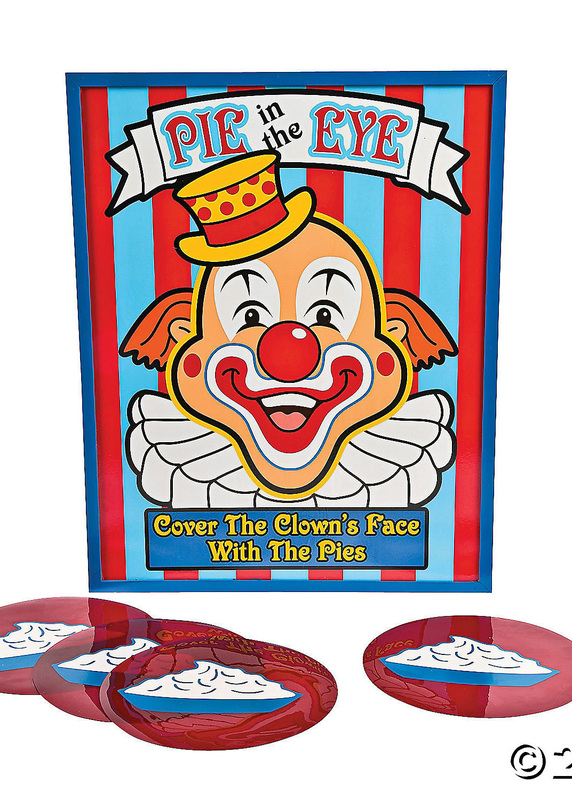 A simple variation of 'Pin the Tail On', this 'Pin the Nose on the Clown' version from supplier 1 ties in nicely with these Carnival party games. 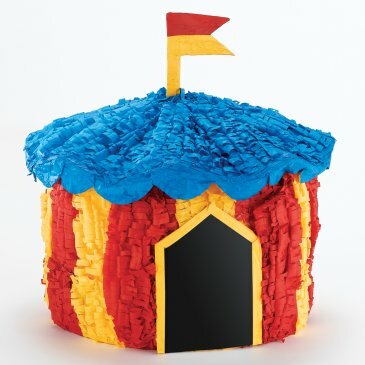 Finish off your Carnival party games with a Carnival themed pinata, such as these Big Top or Clown Pinatas, both from supplier 1. 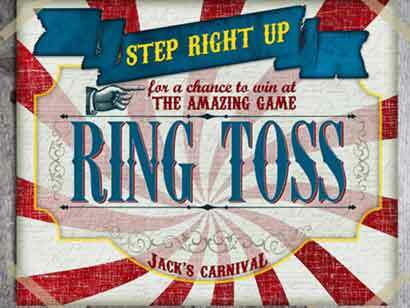 If you've enjoyed these carnival party games, please help me to promote my website by sharing this page. Just click on the Facebook or Twitter buttons below to post a link back to this page, or share this collage image. Alternatively follow the "Enjoy this page?" 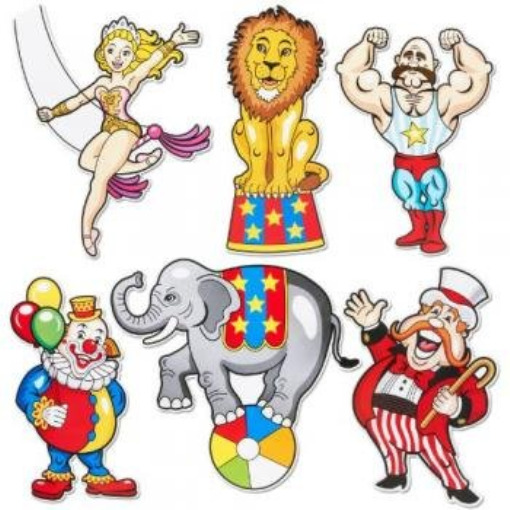 link under the logos below to get the address for this page of carnival party games so you can paste directly into your own blog, website, or any forum that you contribute to.